uuid : fb2ef2a0-8f26-4b33-8302-6b58bbe3c4f7 templates_id: 119577 templates_uuid: "0992522e-d002-4819-83c5-f56e26a7843f" title: "Party Wall Agreement - Create a Party Wall Agreement Template" display_name: "Party wall agreement for repairs" meta_keywords: "Party wall contract" description: "
A party wall agreement is an agreement to record building works with a neighbour of a shared boundary to prevent any dispute when the works are carried out. Why do I need a party wall agreement? You will need a party wall agreement if you\302\222re going to carry out works to a shared boundary and the works have been agreed with your neighbour. A party wall is a wall that stands on the land of two or more owners that can be part of a building or structure (eg a garden wall) or a wall on one person\302\222s land that is used by others. Works that will require an agreement are those that demolish or rebuild the party wall, increase the height or thickness of a party wall, cut into or underpin the party wall. When is a party wall agreement needed? Construction or alterations that involve work carried out (i) on a wall, floor or ceiling that are shared with another (ii) building on the boundary with another property (iii) any excavation within six meters of an adjoining building (iv) repairing a party wall or spouts, sewers, drains or troughs used with neighbouring properties need a party wall agreement.
" created_timestamp: "2018-10-08 04:37:05.0" modified_timestamp: "2018-10-08 04:37:05.0" active: true created_by: 157 modified_by: 157 dcm_id: 261 url_slug: "Party-wall-agreement" meta_description: "Create a party wall agreement with simple step-by-step guidance from Rocket Lawyer. Record the agreed work to be undertaken with your neighbour using this party wall agreement form. Try this party wall agreement template. " 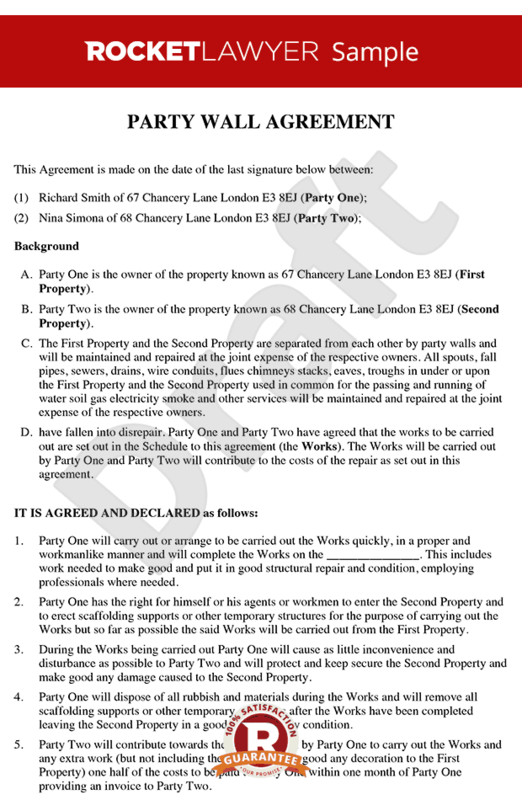 time_to_complete: "10 minutes" role1: "Party one" role2: "Party two"
You will need a party wall agreement if youre going to carry out works to a shared boundary and the works have been agreed with your neighbour. A party wall is a wall that stands on the land of two or more owners that can be part of a building or structure (eg a garden wall) or a wall on one persons land that is used by others. More than just a Party wall agreement for repairs template, our step-by-step interview and guidance makes it easy to create your document. Easily create online, download, print and sign your free Party wall agreement for repairs in minutes. This document is also sometimes called: Party wall contract.